Wartrol Reviews: Doesn't Work For Genital Warts Removal BECAUSE..? Wartrol Reviews: Doesn’t Work For Genital Warts Removal? Wartrol wart remover has been a popular OTC wart treatment solution for years. Does “Wartrol Homeopathic Genital Wart Relief” still exist? What did FDA say about it? We comprehensively review through Wartrol effectiveness and user feedback, where to buy Wartrol, Wartrol side effects, and compare Wartrol vs other OTC wart remover products – to debunk the myth if it is a Wartrol scam. – Wartrol uses FDA approved ingredients. – Active ingredient: 17% salicylic acid. – Liquid wart remover with convenient brush applicator. – Safe and easy to use at home. – Package purchase deals available for cost saving. – Product is not available in retail stores and can only be purchased online. Available worldwide. – Standard or Free shipping term depend on purchase package; Rush shipping option available. – Money back guarantee: Allow return of any unused and unopened item purchased within 90 days. Just what is in it? Wartrol’s active ingredient is salicylic acid, an ingredient that is approved by US Food and Drug Administration (FDA). It works by slowly softening the skin layers, and may cause an immune response from the mild irritation caused by the salicylic acid to fight HPV virus that cause warts. Wartrol’s formula uses 17% salicylic acid, a concentration level that over-the-counter preparations are made available as indicated by Michelle M. Lipke from Department of Dermatology, Marshfield Clinic Wausau Center. Research 1: Based on study published by U.S. National Library of Medicine, 57% of 723 patients used OTC treatment with Salicylic acid before attending GP surgery, and Salicylic acid was the most cost-effective treatment prescribed by a general practitioner. Research 2: Study on 240 patients published by the British Medical Journal shows salicylic acid and the Cryotherapy with liquid nitrogen were equally effective for plantar warts removal, with the cheaper salicylic acid topical treatment is more cost-effective than the liquid nitrogen treatment. Dr. Loretta Ciraldo, a board-certified dermatologist in Miami, shares more on using salicylic acid for warts removal at home in brief video below. The inactive ingredients in Wartrol are Ethyl Alcohol, Flexible Collodion, Menthol, Polysorbate-80, Ascorbic Acid, and Hydroxypropylcellulose. To fully assess how does Wartrol work, understanding of the Wartrol ingredients is important. So let’s look into some of its key inactive ingredients and components as well. Ethyl alcohol, also called Ethanol, is often used as a natural and safe preservative in cosmetic products due to its antiseptic qualities. Ethyl alcohol also serves an antibacterial function that kill wart-causing virus on the surface of the skin, while topically applied Ethyl alcohol acts as a skin penetration enhancer that helps other ingredients penetrate into the skin more effectively. Flexible collodion, often used as a topical protectant, is defined by the International Cosmetic Ingredient Dictionary and Handbook as a mixture of collodion, camphor, and castor oil. Among them, collodion is syrupy solution used as an adhesive to close small wounds, while camphor is used by people topically to treat fungal infections and reduce itching. Primarily utilized in personal care products as a surfactant and emulsifier due to its ability to assist other ingredients dissolve in a solvent, specifically in the case of oil in water. Wartrol, for external topical use only, is to be applied directly on the surface of warts and affected area. Wartrol OTC liquid wart remover comes with convenient brush applicator, which is easy and safe to use at home. Step 1: Identify the wart, whereby common wart is recognized by the rough cauliflower-like appearance of the skin surface, while plantar wart is recognized by its location on the bottom of the foot. Step 3: Dry the area thoroughly. Step 4: Apply a small amount at a time with a brush to sufficiently cover each wart. Step 5: Let dry. Repeat this procedure once or twice daily as needed, until wart is removed, for up to 12 weeks. – Always check with your doctor or dermatologist in case you are not sure if your skin growth is wart. – Do not use this product on irritated skin, or any area that is infected or reddened. – Do not use this product if you are a diabetic, or if you have poor blood circulation. – Do not use on skin moles, birthmarks, genital warts, warts on face or mucous membranes. – Recommendation is not to share OTC wart remover you have used with anyone to prevent virus spread. Now, let’s go straight to the point by examining the packaging case and label of Wartrol “Maximum Strength” OTC Liquid Wart Remover as evidence. As shown below, the Wartrol warnings clearly state DO NOT USE ON…GENITAL WARTS. Since it is clearly stated on the Wartrol package case, then what are the (possible) reasons that some people still explore using Wartrol for genital warts treatment? Scenario #1: People heard about Wartrol however they have not personally bought / used Wartrol before. Scenario #2: People used Wartrol on plantar / common warts but did not notice the Wartrol warnings above. The Wartrol package case and label shared above should address these. Scenario #3: People are not aware of other OTC solutions thus explore Wartrol for genital warts treatment. This will be further covered later when we compare Wartrol versus other OTC wart products, so just read on. Scenario #4: The biggest myth – there were real success stories of using Wartrol to get rid of genital warts. 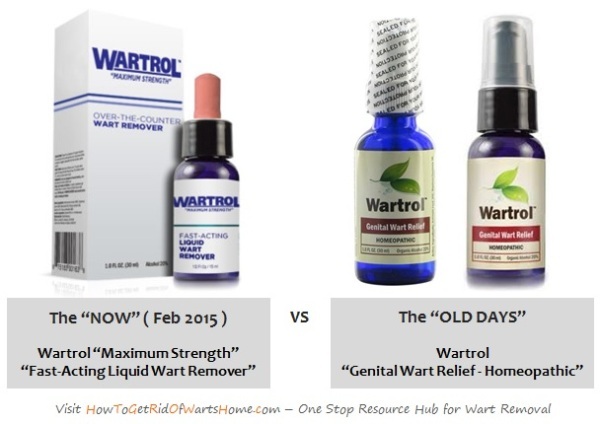 Wartrol used to have an OTC solution labelled “Genital Wart Relief – Homeopathic” in the past. However, for whatsoever reason, the Wartrol official website www.wartrol.com no longer display / mention / sell this sub-brand labelled “Genital Wart Relief” now. 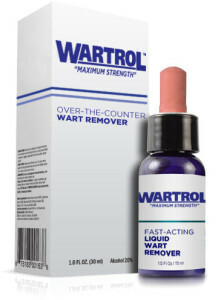 The Wartrol “Maximum Strength” OTC fast-acting liquid wart remover that is currently in the market (and also available in the past) is formulated to get rid of Plantar warts, Common Warts, and Flat warts according to Wartrol official website – without any single term mentioning it is a solution for “Genital warts”. This fully aligns with the Wartrol warnings stated on its packaging case and label as shared earlier. Refer below comparison. Don’t just take my word, click to visit Wartrol official website to check it out yourself. Don’t feel disappointed, as you will be guided with the alternate OTC genital wart remover solutions in the product comparison review later. Just read on, or click and go straight to the alternate genital wart treatment options. It is commonly known that all medicines have side effects, just that most people do not feel the side effects or they are able to deal with them. Some rare side effects of salicylic acid wart remover that can occur are skin irritation, dryness and peeling of skin, skin redness, and slight burning; But these are usually very mild. If discomfort persists or if you notice any symptoms of serious allergic reaction, stop using the product and seek immediate medical attention by consulting your doctor or dermatologist. The Wartrol “Maximum Strength” OTC fast-acting liquid wart remover has been used by thousands of people to remove plantar warts, common warts, and flat warts. Below are some positive customer reviews from the Wartrol users. No product is perfect, just as different people would have different reaction to the same medicine. It is not surprising to find some feedback that the results of using Wartrol were not promising, just like below. 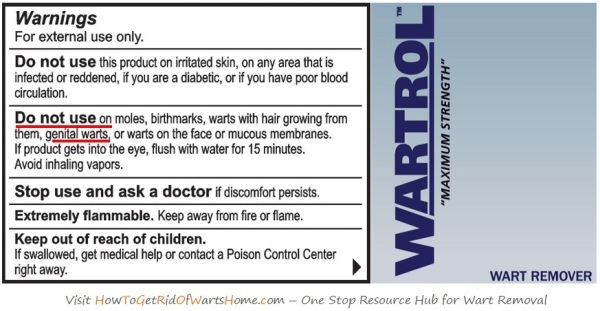 Wartrol OTC wart remover is not available in local stores (like Walmart) and can only be purchased online. Whether you are in UK / Canada / Australia, Wartrol is available to purchase worldwide via the Wartrol official website without prescription, with 90 days full money back guarantee from the date of purchase. Visitors to Wartrol website often find difficulty to retrieve info on how much is Wartrol, because the front page of Wartrol website does not display the Wartrol pricing info. Only until you fill up the personal particulars and press the “Start My Order” button, then only you will be shown the latest Wartrol package offer / deal for your selection. >> Visit Wartrol official website to find out its latest package deals and best price or try out Wartrol. Wartrol And Genital Warts: What Are The Alternate OTC Solutions? Let’s compare Wartrol with some alternate OTC wart remover and solutions with key summary and comparison table as below, or you can refer to this detailed genital wart cream review guide for comprehensive understanding. 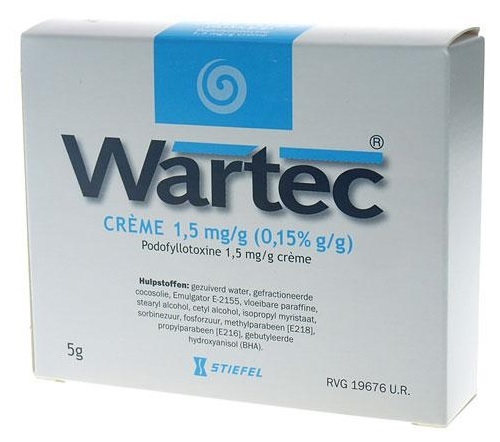 Wartec is an over the counter topical cream widely used for HPV genital warts treatment, especially in Europe and UK (under the trade name of Warticon). The active ingredient in Wartec cream is Podophyllotoxin, a plant extract with antiviral and antiwart properties. Wartec OTC cream also contains other inactive ingredients such as propyl methyl hydroxybenzoate, purified water, sorbic acid, stearyl alcohol, fractionated coconut oil, butylated hydroxyanisole (BHA) etc. >> Check out comprehensive Wartec cream reviews. Nevi-Skin is a topical treatment cream formulated with natural herbal extracts, for removal of genital warts, plantar foot warts, hand warts, mosaic warts, moles on the skin and face, skin tags and syringoma. 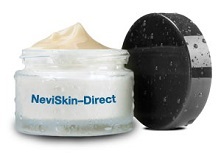 >> Check out Nevi-Skin reviews. Wartrol “Maximum Strength” OTC Liquid Wart Remover, with its 17% Salicylic acid as active ingredient, is formulated to get rid of plantar warts, common warts, and flat warts. If you are specifically looking for genital warts solution, then alternate wart creams are recommended. >> Visit Wartrol official website to find out latest details or try out Wartrol 90 days full money back guarantee. ← Underarm Boils in Armpit: Treatment of Recurring Boil That Smells?